JustHost hosted for over 4 years now. JustHost is one of the most popular website hosting services available today. We were lucky enough to interview Ron Trout, owner of GalaxyHost.biz, regarding his experience with JustHost. Ron has a reseller account, which may be a good option for you. Welcome Ron! Thanks for taking the time to answer our questions about your experience with JustHost. Please tell us more about you and your business. I am a self-employed “go getter” with experience in many fields of the construction trade. My business mainstay is operating a portable sawmill service and I am also a yurt manufacturer. 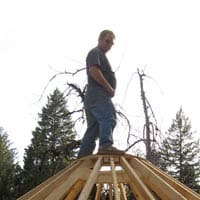 I build websites for myself to advertise my services along with ecommerce stores that sell products targeting the sawmill and tree service industry. As an adjunct to my main business, I also build websites and provide hosting for others in the sawmill trade. My experience and knowledge as a sawyer has helped others grow their sawmill business through web design. After the initial web design my web hosting resellers account becomes a passive income stream via renewals each year. I have been building websites and providing web hosting with JustHost for four years now. How easy or difficult it was to set up your resellers account with JustHost? Setting up my resellers account was fast and easy. Learning was easy with the video tutorials they have. WHMCS for [automated] billing was also easy to learn and set up. "Learning was easy with the video tutorials they have." Note: JustHost no longer offers Reseller Account. The nearest account type is their VPS. With so many options available today, Ron, can you tell us what made you choose JustHost over other website hosting services? The price was very competitive and after talking with them over the phone they seemed knowledgeable and helpful. Are there any special features or account freebies from JustHost that you particularly like? Tell us about them. The WHM (Web Host Manager control manager) and WHMCS (for client management, automated billing and support) come with the reseller account and I am very happy with them. This makes creating accounts a breeze. The integration for client registration and automation for the free eNom account (domain registration) is the way to go if you are serious about having clients sign up, pay and get started with a smooth and seamless process. The cPanel for my account is very helpful and the cPanel access for my clients also is very good for both my clients and myself. The phone support is at no extra cost and is something I would not want to do without or have to pay for. How do you find JustHost in term of uptime reliability? Do any of your clients complain about excessive downtime? I have never had a complaint about downtime from my customers. I do keep a close eye on all my sites and have had prompt resolutions to any downtime I have encountered. "I have never had a complaint about downtime from my customers." But what about the hosting speed? Do you receive any complaints from your clients that their sites load very slowly? No, never from my clients. I did notice myself some slow loading sites once. After contacting JustHost I found it was due to an upgrading process and it was back to normal in a reasonable time. Have you dealt with JustHost customer support? I have contacted customer support for a number of technical issues. They have always been prompt and friendly in helping me out. All issues were resolved and any problems taken care of in a timely manner with a single email or phone call. Their response time is always within 24 – 48 hours. They have always known what to do or else bumped me up to a higher level of experienced technician who could help. "Their response time is always within 24 – 48 hours." It’s been a pleasure learning more about you, Ron, and hearing the details of your experience with JustHost. Thanks for your valuable input! To learn more about the host, see our analysis on JustHost.